The sight of a skeleton or skull invokes a sense of horror in most men. However, this particular object also happens to be a trait when it comes to a particular genre of jewelry i.e. the macabre range. Anything dark and brooding is popular here! It is the guys who are often swayed by the bones as it makes them feel brave and important. However, the girls are not quite untouched by this special appeal of skulls either. 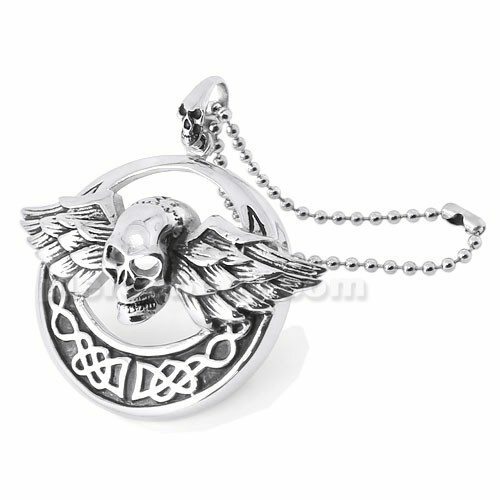 The sinister skull in all forms realistic and imaginary can be seen on jewelry therefore with both the girls and guys adorning their bodies with it. The pendant is particularly popular here, more so because you can hide it obtrusively under your clothes and flaunt it whenever you want to do so. It might help you to check piercebody.com for their impressive array of dark skull and Stainless Steel Skeleton Wings Pendant jewelry. The unique design of skeleton wings is sure to attract your attention though and you are bound to be excited at the thought of a cute and awe inspiring skeleton on wings dangling from your neck on a petite steel chain. You are free to use it as a logo of your own group and make your own distinctive mark in the area you hang around. Do not use it as a mourning jewelry, however. It would certainly not go with the style. The wings are surely not befitting of the dead. This pendant happens to portray a positive image in spite of being a member of the macabre range. So, go ahead and purchase it as soon as you can. Such a thing of beauty with its beautiful features cannot really be meant to depict the gloom and doom. You can definitely wear it as a symbol of courage though or to lead a secret society. Wearing it at a party might also help you to attract loads of girls, if you happen to be a groovy guy who remains fearless in the face of opposition. Whatever be your intentions, do not go out of your way to look for cheap copies of this gorgeous pendant. The stainless steel is apt for your skin as it is totally immune to corrosion and bacteria that would have caused you irritations and infections otherwise. Look at the price for a moment. It is available at a never before offered price of 4.99 only. You can afford that surely instead of settling for cheap copies.